Spread Co., Ltd. (HQ: Kyoto, Japan, CEO: Shinji Inada, Hereinafter “Spread”), which is a member of Earthside group, started shipping its products from Techno Farm Keihanna (Kizugawa, Kyoto) on November 1, 2018. Techno Farm Keihanna is the largest automated vertical farm in the world* where the automated cultivation system is capable of producing 30,000 heads of lettuce every day. The production capacity of Techno Farm Keihanna is 30,000 heads of lettuce per day and it is approximately 1.5 times bigger than that of Kameoka Plant, Spreadʼs existing vertical farm (Kameoka, Kyoto). Techno Farm Keihanna has introduced the latest advanced technologies such as an automated cultivation system, water recycling and environmental control technologies and specialized LED lighting customized for vertical farming. Meanwhile, the scale of the farm and stability of production have been further increased. Techno Farm Keihanna utilizes IoT/AI technologies developed by Spread to further optimize the cultivation environment through greater analysis. Alongside this, Spread will draw on research and development facilities situated inside Techno Farm Keihanna to develop new cultivation technologies. At Techno Farm Keihanna, four kinds of leaf lettuces are produced without the use of pesticides. Spread has incorporated more rigid standards for hygiene control of the cultivation environment and aims to gain the international certification of food safety standard “FSSC22000” **. 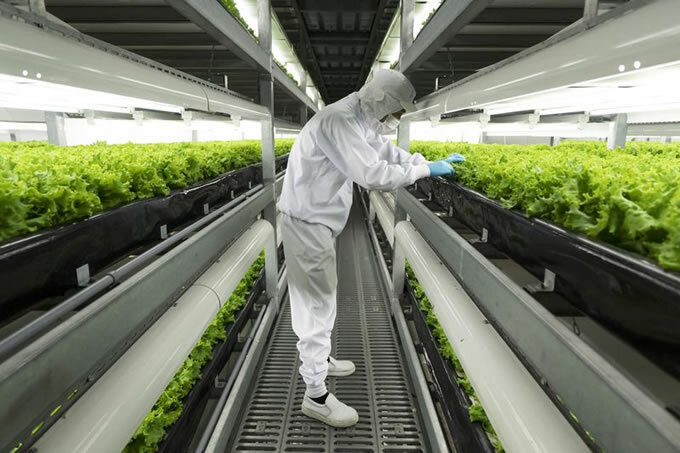 Lettuce produced in Techno Farm Keihanna is to be sold under “Vegetus”, Spreadʼs brand of vertically farmed vegetables, at supermarkets and retailers all over Japan. Spreadʼs Techno Farm Keihanna will act as the flagship model of Techno FarmTM, the next generation agricultural production system, which Spread aims to expand to more than 100 locations through partnerships including a franchise business model. To achieve a sustainable model for agriculture, Spread will continue to pursue further technological innovation by deepening its cooperation and collaboration in various fields. * Measured by production weight per farm area and defined as a vertical farm that implements automation for cultivation processes of leafy vegetables for shipment to general consumers (internal investigation). ** A track record of operation of the farm is a requirement to apply for this certification.